It has taken us a bit of time but yes we can. The match was played at Turf Moor on Wednesday 25th April 1951 and despite it being an afternoon kick off there was still a fairly healthy crowd of 15,000 in attendance. The Clarets fielded what was pretty much a first XI line up as follows: Strong, Woodruff, Mather, Adamson, Cummings, Bray, Stephenson, Chew, Holden, McIlroy and Lyons. One interesting foot note is that with the Clarets losing 1-0 at half time Terry Lyons was substituted for Les Shannon this being 14 years before subs were allowed in the football league and it was Shannon who scored Burnley’s only goal of the game pulling the score back to 2-1 before Woitkowak scored the 3rd for Hamburg. Also of note was the fact that Manchester City goalkeeper Bert Trautmann acted as interpreter for the visitors and that Hamburg’s own keeper rejoiced under the name of Warning. 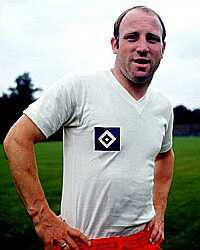 The visit of Hamburg was something of a culture shock for the locals if only for their strip of white shirt with blue badge, red shorts and blue socks with white trim as modelled in the picture by the great Uwe Seeler who was to play at Turf Moor himself in 1961 (he didn't play in the 1951 match) before lending his name to a future Claret legend featured below. Am I correct in thinking that despite relegation during Jimmy Mullen's sole season with Burnley in Division 1 that the team did in fact enjoy the longest unbeaten run of any other team in the Division? If so, what were the games and results? The worrying thing for me is that our unbeaten run this season also ran for 10 league games. I suppose the difference is that this time we won 6 and drew 4 whereas last time we won 3 and drew 7 and of course we now have a much better team! Can you tell me which members of the England 2002 World Cup squad have played at Turf Moor in their career? I guess Teddy Sheringham, Trevor Sinclair, Robbie Fowler and possibly David Seaman. You are right about Teddy Sheringham, Trevor Sinclair, and Robbie Fowler whilst I don’t think David Seaman ever did but there are 3 others you are missing. Teddy Sheringham played for Spurs in the League Cup 2nd round first leg, which ended 0-0 on 22/9/93 and was mercilessly taunted with chants of ‘You’ll never play for England’ despite the fact that he had made his debut for the national side in May of that year and has now played a total of 51 times. Trevor Sinclair came on as a sub for Blackpool in the 1-1 draw at home to Blackpool on 11/1/92 and played extremely well as I remember. Robbie Fowler played on 28/1/95 in the FA Cup 4th round along with Liverpool goalkeeper David James. Just to put that in some sort of historical context for you, it was 3 days after the infamous Cantona kung- fu kick at Crystal Palace. John Mullin nearly won it for the Clarets near the end but it finished 0-0 before we lost 1-0 at Anfield in the replay. A certain Sol Campbell played in the same game as Sheringham in 1993 and was given a hard time by John Francis but perhaps the most surprising is Rio Ferdinand who played in a 1-0 defeat for Bournemouth whilst he was on loan there in November 1996. I don’t think any of the others have played in a competitive first team match at Burnley but if you know different please let us know on the link at the bottom of the page. In the new Burnley book The Pride and Glory it says that Edward Heath opened the Cricket Field Stand in 1973 and the Bob Lord Stand in 1974. I know he opened the Bob Lord Stand but did he also open the Cricket Field Stand? You are right to have your doubts about this. The Cricket Field Stand was officially opened by Lord Rhodes the Lord Lieutenant of Lancashire before a pre-season friendly against Middlesbrough in 1969. It can be seen under construction in what looks like a scene from The Battle of the Somme as the Clarets took on Derby in a 3rd round FA Cup match in January of that year. The then Prime Minister Edward Heath did visit Burnley in November 1973 and at the invitation of Bob Lord, who had met him in his capacity as an executive of the Football League, he also came to visit Turf Moor but there were no stands to be opened. 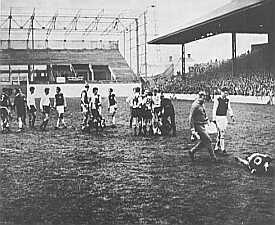 Heath’s visit to Burnley was to try and rally support during the Fuel Crisis of that year that saw the introduction of petrol rationing, rolling power cuts, a 3 day working week and, worse of all, Clarets games kicking off at 2:15pm because we weren’t allowed to use the floodlights. During his trip Bob Lord invited him to return to open the new stand that was then being constructed that would bear his name. There are two ironies to the story. Firstly, the Fuel Crisis, for which Heath might have shouldered some of the blame, delayed work on the stand as it meant that the steel could not be manufactured. Secondly it was suggested that Lord was angling for some sort of honour, which I’m sure would have been well deserved, but by the time Heath did return in September 1974 to perform the opening ceremony he was no longer Prime Minister. One interesting aspect of this is that it took the construction of the Cricket Field stand complete with changing rooms and other facilities to enable the demolition of the old Brunshaw Road stand which had been in place for 60 years and had previously housed those facilities. Unfortunately relegation in 1971 meant that the building work was delayed whilst the Clarets regained top division status again but even then the Bob Lord stand was built to a far less grandiose plan than had been Lord’s original intention. To round off your question it seems that confusion over Heath’s 1973 visit led to the mistake but I can’t really explain why it would be suggested that a stand would be officially opened 4 years after it was built. How many times have the Clarets squad been featured on record/CD? As far as I am aware no squad of Burnley FC players has ever featured on disc. A record on cassette tape was released for the play off final at Wembley in 1994 but that did not involve all of the players though we believe John Pender and Andy Farrell might have played some part in it. A Clarets Collection CD was released in early 2000 featuring various Burnley related songs, commentary and interviews, which is very good and is still available for sale on the Internet. Trivia alert! Which Clarets player has performed on a Number 1 single? Ralph Coates who sung with the England team on the classic 1970 World Cup song ‘Back Home’ before being left out of the final squad that travelled to Mexico. I was stood on the Cricket Field end when Field Marshall Viscount Montgomery was guest of honour. Can you please provide details as to date, teams, score and attendance? Monty’s visit was for a fairly crucial game against Leeds United in season 1965/66. It was the Clarets last home game of the season and going into the match we were 2nd in the table though we stood no chance of catching champions Liverpool. Leeds were our nearest rivals and a win would have meant that the Clarets would have eventually finished runners up. Unfortunately a bizarre own goal by Alex Elder saw Leeds run out 1-0 winners and they went on to take 2nd place. The match was a bit rough to say the least with one Sunday paper dubbing it ‘The Battle of El Alamein’. Burnley lined up Blacklaw, Angus, Elder, O’Neil, Miller, Todd, Morgan, Lochhead, Irvine, Harris, Coates and the crowd was 33,035. I can’t remember Peter Noble ever missing a penalty. Did he? Yes and no. I was fortunate enough to discuss this with Peter once and I think we eventually decided that on 13/3/79 he did actually miss a penalty against Luton Town at Turf Moor but the referee allowed him to re-take it because the keeper moved and he slotted away his second attempt. Apart from that I believe that he did indeed score all of the others. His penalty taking ability was phenomenal but I think his scoring record has become a bit of a myth. I have read an interview with him when he claims to have notched 28 out of 28 successful penalties for Burnley but as much as I count and recount the records I can only make it add up to 18 in competitive matches for Burnley plus one against Mansfield Town in the semi-final of the Anglo-Scottish Cup in 1978 which went to kicks from the penalty mark. Just to tie this in to the first question, for those not in the know, Peter Noble was universally known as Uwe during his time as a Claret for either his similar heading prowess or his lack of hair or possibly both! Who was the first black footballer to play for Burnley and how was he received? 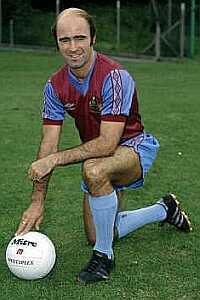 In modern times it was Les Lawrence who signed for the Clarets in November 1984 for £20,000 from Rochdale. Lawrence is not remembered as a particularly good player despite scoring 11 goals in his 24 starts but his 18 months at Turf Moor coincided with part of the worst period in our history. He was followed by Robert Regis, George Oghani and Winston White. As you would expect they were all received exactly the same as anyone else joining the club and were judged entirely on merit as players with Oghani quickly becoming something of a hero.